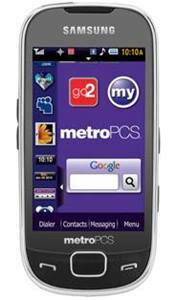 MetroPCS has launched a new mobile phone for its users which is named as Samsung Caliber. The Samsung Caliber is a touchscreen phone which has been featured with Samsung’s TouchWiz User Interface. The phone has been integrated with social networking applications such as Facebook and MySpace. The touchscreen phone is featured with a 3.2-inch WQVGA touchscreen display with 262K colors. The Samsung Caliber is also equipped with a 3-megapixel photo snapper with video recording function. It boasts with voice recognition, integrated with MetroNavigator GPS navigation system, Metro 411 Directory Assistance, MetroWEB and music player. In addition, it is Bluetooth enabled and supports up to 16GB of microSD card. The phone has comes with a 1080mAh Lithium ion battery that supports up to 4.5 hours of talk time and up to 300 hours of standby time. The phone with measurement of 2.2 x 4.5 x 0.47-inches and weighs at 3.74 ounces is priced at $249 before a $90 mail-in rebate without service contract.